sometimes a comfort zone is a luxury. I welcome any comments. Ink and digital. brilliant! that really is packed..
great piece - i love all the details and line work. it's funny, I did a similar sardine theme this week! 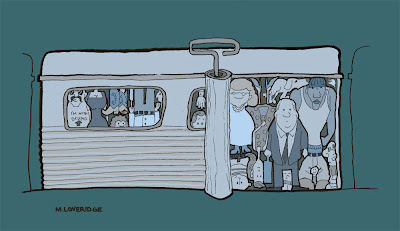 great illustration it truly depicts the morning trains to melbourne no matter how frequent they are packed. I like the colour you used too. Matt, So I don't know if you have time for this, but since I don't really have friends and my sisters refuse to blog, I picked you to tag. Have fun with it, if you have time. BTW I love checking out your latest and that cannibal pic is hilarious! Nice concept. Nice characters. Double good.